The purpose of "Engineering Cybernetics" is then to study those parts of the broad science of cybernetics which have direct engineering applications in designing controlled or guided systems. Qian Xuesen (in English Hsue-Shen Tsien or H.S. Tsien; December 11, 1911 – October 31, 2009) was a Chinese scientist and pioneer for engineering cybernetics, who made important contributions to the missile and space programs of both the United States and People's Republic of China. I do not plan to come back. I have no reason to come back.. I plan to do my best to help the Chinese people build up the nation to where they can live with dignity and happiness. The celebrated physicist and mathematician A.M. Ampere coined the word cybernetique to mean the science of civil government (Part II of "Essai sur la philosophic des sciences", 1845, Paris). Ampere's grandiose scheme of political sciences has not, and perhaps never will, come to fruition. In the meantime, conflict between governments with the use of force greatly accelerated the development of another branch of science, the science of control and guidance of mechanical and electrical systems. It is thus perhaps ironical that Ampere's word should be borrowed by N. Wiener to name this new science, so important to modern warfare. The "cybernetics" of Wiener ("Cybernetics, or Control and Communication in the animal and the Machine," John Wiley & Sons, Inc., New York, 1948) is the science of organization of mechanical and electrical components for stability and purposeful actions. A distinguishing feature of this new science is the total absence of considerations of energy, heat, and efficiency, which are so important in other natural sciences. In fact, the primary concern of cybernetics is on the qualitative aspects of the interrelations among the various components of a system and the synthetic behavior of the complete mechanism. The purpose of "Engineering Cybernetics" is then to study those parts of the broad science of cybernetics which have direct engineering applications in designing controlled or guided systems. It certainly includes such topics usually treated in books on servomechanisms. But a wider range of topics is only one difference between engineering cybernetics and servomechanisms engineering. A deeper - and thus more important - difference lies in the fact that engineering cybernetics is an engineering science, while servomechanisms engineering is an engineering practice. An engineering science aims to organize the design principles used in engineering practice into a discipline and thus to exhibit the similarities between different areas of engineering practice and to emphasize the power of fundamental concepts. In short, an engineering science is predominated by theoretical analysis and very often uses the tool of advanced mathematics. That the government permitted this genius, this scientific genius, to be sent to Communist China to pick his brains is one of the tragedies of this century. In 1948, the MIT mathematician Norbert Wiener gave a widely read, albeit completely nonmathematical, account of cybernetics. A more mathematical treatment of the elements of engineering cybernetics was presented by H.S. 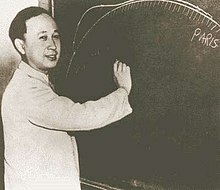 Tsien in 1954, driven by problems related to control of missiles. Together, these works and others of that time form much of the intellectual basis for modern work in robotics and control. Richard M. Murray et al. (2003) "Future directions in control in an information" in: IEEE Control Systems Magazine. April 2003. Qian Xuesen... didn't like being called the father of China's guided-missile program: he felt that the title didn't give credit to his fellow researchers. Indeed, while the Chinese-born, U.S.-educated rocket scientist was technically brilliant, he also realized that legions of bright thinkers can do far more than one genius ever could. Austin Ramzy (2009) "Qian Xuesen" in: Time Magazine. Nov. 16, 2009.